WaterBOB FAQ | How much water does the waterBOB® hold? The waterBOB® is an emergency drinking water storage system that holds up to 100 gallons of fresh water and it can be used in any bathtub in the event of an emergency. It’s very easy to use. Simply lay the waterBOB® liner in your bathtub, attach the fill sock to the faucet and fill the bladder to capacity, which takes approximately 20-30 minutes, depending on water flow and size of tub. A siphon pump is included to easily dispense the water into jugs or pitchers for use. Included are very easy to follow instructions that include photographs and is also printed in Spanish as well. Why do I need the waterBOB®? During a hurricane or tropical storm, water main breaks and storms surges can interrupt or even contaminate the public water supply. Without clean water it becomes life threatening. How much water does the waterBOB® hold? This depends on the size of your bathtub and how much you fill it, but it can hold as much as 100 gallons. Most standard bathtubs hold approximately 60-70 gallons of water. Do not fill the waterBOB® over the edge of your tub. Where is the waterBOB® made? The waterBOB® was invented in Wausau, WI by Mr. Tony Woodruff. Tony met with various companies in several countries seeking the best equipped manufacturer capable of producing the waterBOB®. After careful consideration, the decision was made to use a China based company. This company continues to be committed to meeting the strict requirements necessary to produce a safe and dependable waterBOB®. The company also had a proven reputation for producing quality packaging products for several U.S. and European food manufacturers. What about odd shaped bathtubs? Is a bathtub needed to use the waterBOB®? The waterBOB® will work in virtually any bathtub despite its size and shape. The waterBOB® is constructed of heavy-duty 10 mil food grade Linear Low Density Polyethylene (LLDPE) plastic. As a result of the design, materials and construction of the waterBOB®, it can be filled to capacity without the support of a bathtub. The primary reasons we recommend the waterBOB® be placed in a bathtub are for containment, in case the waterBOB® develops an accidental leak caused by a pet or sharp object and for convenience when emptying after use. Do not fill the waterBOB over the edge of your tub. How long can I store water in the waterBOB®? The water will stay fresh for up to 16 weeks, depending on humidity and temperature conditions. Always keep direct sunlight away from the waterBOB® by covering with towels or a sheet. Direct sunlight accelerates the growth of contaminates. If you have well water, it is advisable to immediately treat the water in your waterBOB® once it is filled. Be sure to wait the specified time prior to use. What if we need to store the water for more than 16 weeks or I have well water? The water can be treated with the use of water purification tablets which can be purchased at most outdoors or sporting goods stores. Follow the directions for use on the package you purchase. If the emergency has left you with no water beyond the 4 week safe storage time and you have no other means of purification, you may treat the water with liquid chlorine laundry bleach. NOTE: do not use scented laundry bleach, powdered bleach, or swimming pool chlorine – these may contain additional chemicals that are poisonous. Below is a chart showing how much liquid bleach to add to the water. After you add the bleach, thoroughly mix by stirring or shaking the container. Let the water stand for 30 minutes before using. A slight chlorine odor should be noticeable in the water. If not, add another dosage of bleach and allow the water to stand another 15 minutes before using. The waterBOB® is intended for a one time use. This is for a couple of reasons. In order for the waterBOB® to be used a second or third time, it would need to be emptied and completely dried and free of contaminates, otherwise the water may be contaminated once it is filled a second or third time. Another reason for the single use recommendation is if the bladder was in some way damaged while being emptied, you would not realize it until it was needed for use and at that time it would be too late. Theoretically, if the bladder was emptied carefully and not damaged, dried completely, it could be refilled however, the water would absolutely need to be treated and tested prior to use, to insure safe consumption. How long does it takes to fill the waterBOB®? This depends on your home’s water flow, but usually around 20 minutes. How do I get the water out of the waterBOB®? Included in the package is a siphon pump that easily dispenses the water into a pitcher or jug. What is the waterBOB® made of? The waterBOB® is constructed of heavy-duty 10 mil food grade Linear Low Density Polyethylene (LLDPE) plastic. This material follows and stays within US FDA guidelines. Why can’t I store water in the bathtub without the waterBOB®? Most bathtubs have dirt and soap film that would contaminate the fresh water. In addition, debris and other items may fall into the water which would cause it to spoil and become useless. 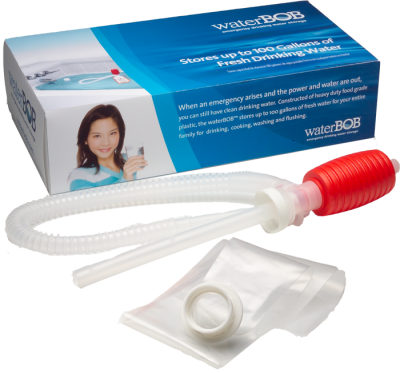 In what emergencies would I use the waterBOB®? Be prepared for any emergency with the waterBOB®. Every household should have several for temporary water storage during emergency situations and after disaster relief. The waterBOB® is needed for a hurricane, tropical or winter storm, tornado, earthquake or flood. Anytime there is a water main break or flood conditions, the public water supply may be contaminated and unsafe to use. Others uses for the waterBOB® include RVs and campers for storage and for homes and cabins in remote areas where it is hard to find fresh water. Why is it called waterBOB®? Water is what the liner holds; the BOB is short for “Bathtub Oblong Bladder”.